Scientists at Oak Ridge National Laboratory Search for "Supersolids"
Hans Lauter with the sample environment cell within which he grows the solid helium samples used in his neutron scattering experiments at ORNL's Spallation Neutron Source. Scientists at Oak Ridge National Laboratory are searching for the quantum state of matter called supersolidity. 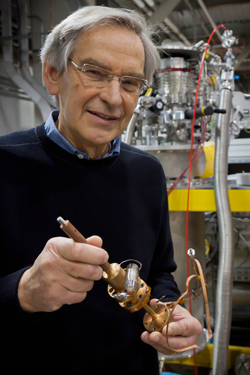 Now conducting research at ORNL’s Spallation Neutron Source, Hans Lauter has observed a superfluid transition in solid helium and believes that may lead to supersolid helium as a new quantum state. A series of neutron scattering experiments at Oak Ridge National Laboratory and other research centers is exploring the key question about a long-sought quantum state of matter called supersolidity: Does it exist? Whether there’s such a thing as supersolidity isn’t an issue apt to cause much of a stir outside the physics community. But in the world of condensed matter physics, discovering a new quantum state would be like sighting a new species would be for a biologist, or a new star for an astronomer. Quantum superstates—stranger than fiction Quantum mechanics describes the way matter behaves at the nanoscale (the atomic/molecular level), where “particles” of matter are simultaneously waves (at least in quantum theory). Observations from the world of quantum mechanics seem completely bizarre to us because all our experience and intuitions argue against them: a particle/wave can, at the same time, move and not move, it can be in more than one place at the same time. We don’t see these behaviors in everyday-size objects because quantum states are exquisitely fragile, easily crushed by the comparatively huge forces in what physicists call the macro world. In fact, only two “superstates” resulting from quantum mechanics have been conclusively observed at the macro level: superconductivity, in which electrons pair up and flow without resistance through a material, and superfluidity, in which liquid helium loses all viscosity and can flow through the finest pores in any material. And both of these states so far are seen only at very low temperatures at which there is little energy to disrupt them. The supersolid state would be even more elusive, existing only in helium-4 cooled to barely above absolute zero (0 kelvin, the temperature at which atoms lose all their energy) and subjected to extreme pressure. Understandably, many people hearing the word “supersolid” assume it means something really hard. Actually, it indicates almost the opposite (“super” in this case means beyond solid rather than more solid). It’s a profoundly difficult concept. Picture a puzzle with several pieces missing. Imagine the vacant spaces beginning to flow through the tiny seams between the puzzle pieces, eventually pooling together and seeping through the entire picture as a wave. That’s something like how physicists conceive of a supersolid: the atoms in the material have spatial order (i.e., each atom occupies a particular position in space), but under certain conditions, vacancies in the structure begin to flow through the solid without resistance, like a superfluid. The existence of supersolid helium has been predicted theoretically but never observed conclusively. In 1969, physicists in Russia theorized a state of solid matter in which vacancies in the crystal structure of solid helium-4 could condense into something like a single entity and flow without resistance through the atoms. Experimenters at Penn State University claimed to have verified the existence of supersolid helium in 2004 in experiments using an oscillator, but others questioned whether they actually observed a supersolid, or just a superfluid confined in solid helium. Hunting supersolids with neutrons A paper published recently in Physical Review Letters adds significant knowledge to the debate, although it doesn’t settle it. A research team led by Lauter, in experiments at the Institut Laue-Langevin neutron scattering center in France, obtained data indicating a superfluid state incorporated in a sample of solid helium-4, but not necessarily a supersolid state. A series of follow-on experiments conducted at the Spallation Neutron Source at Oak Ridge National Laboratory showed “deviations from known structures” in solid helium, but data from those studies are still being analyzed, Lauter says. He is preparing yet another set of experiments early in 2012 at SNS, along with computational calculations, that he hopes will establish precisely what happens inside solid helium under extreme temperature and pressure. The Cold Neutron Chopper Spectrometer at SNS is the best instrument available for measurements at the momentum and energy ranges at which superfluid effects manifest, says Lauter. And SNS has the sample environment capabilities to make the experiments feasible. “Superflow effects appear below a temperature of about 100 mK and in the pressure range from 25 to 60 bar. To look for these effects within the same range, a special sample cell and a dilution refrigerator are necessary,” Lauter notes. A one-of-a-kind sample cell had to be designed and fabricated from an alloy that meets stringent requirements for heat conduction and ability to withstand pressure, and produces little background scattering. A dilution refrigerator had to be adapted for neutron scattering and for unusual stepwise increases and decreases in temperature. The ILL experiments by Lauter’s team studied a 3 by 5 centimeter sample of solid helium-4 powder condensed in a matrix of highly porous aerogel. Previous experiments have indicated that the supersolid effect would appear only in a crystal that is perturbed (i.e., made to deviate from its ideal structure). The aerogel matrix generates numerous dislocations, which act as nucleation sites for imperfections. The scattering results showed both a pattern indicating solid helium and a liquid dispersion curve somewhat different from the pattern characteristic of liquid helium under pressure, says Lauter. “So we have these two signs—the sign from the solid and from the liquid. But we do not have signs of a supersolid.” The dispersion curve of the liquid revealed energy excitations (called “rotons”) that were like those seen in superfluid bulk helium but displaying different parameters. “Therefore, they must originate from the development of quasi 2-dimensional superfluid helium within the solid helium,” Lauter says. The experiments at SNS are performed with solid helium-4 without the constraint of a confinement. This will help determine the microscopic (atomic-level) origin of the transition to superflow and, the researchers hope, show a transition from solid to supersolid behavior. Unlike oscillator experiments, neutron scattering can show the actual atomic interactions, Lauter points out. The experiments are arduous and time-consuming. The helium crystals must be grown inside a sophisticated sample environment at a temperature barely above 0 K (approximately -459°F or -273°C) and a pressure many times atmospheric pressure. Growing the crystal in the desired state can take half the experiment time, says Lauter. A researcher using neutrons never actually sees the solid helium sample, he points out, because it can exist only inside the special sample environment. The atomic-level origin of supersolidity can be observed only indirectly through experimental means. Be the first to comment on "Scientists at Oak Ridge National Laboratory Search for “Supersolids”"